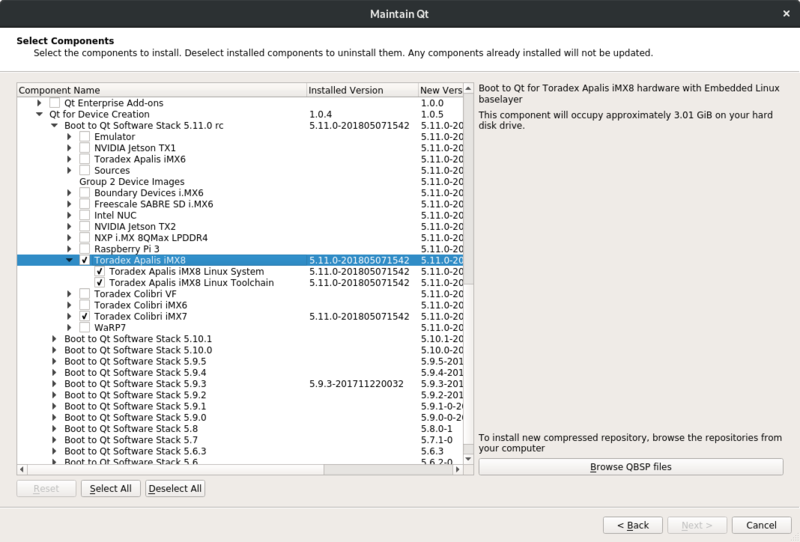 The Qt Company supports Boot to Qt for Apalis iMX8 with the Qt 5.11 release. Right now there are release candidates available for the Qt 5.11 release. This article describes how to use Boot to Qt on Apalis iMX8. The Qt for Device Creation is a commercial offering from the Qt Company. You can register for a free trial which allows to try out Boot to Qt for Apalis iMX8. Download the Qt installer from www.qt.io/download. Start the installer and login with your account. In the component selection dialog make sure to select "Toradex Apalis iMX8" in the "Qt for Device Creation" section. Also make sure to install the Qt Creator and the Boot to Qt Flashing Wizard. You can flash the Boot to Qt image using the flashing Wizard from within Qt Creator. Select "Flash Boot to Qt device" from the "Tools" menu. Follow the steps of the Wizard and make sure to select the Apalis iMX8 image. The SD card will be a bootable SD card. By default the SD card starts the Qt demo application. The Qt Creator can be used to create Qt applications for i.MX 8 and can be directly deployed over network. 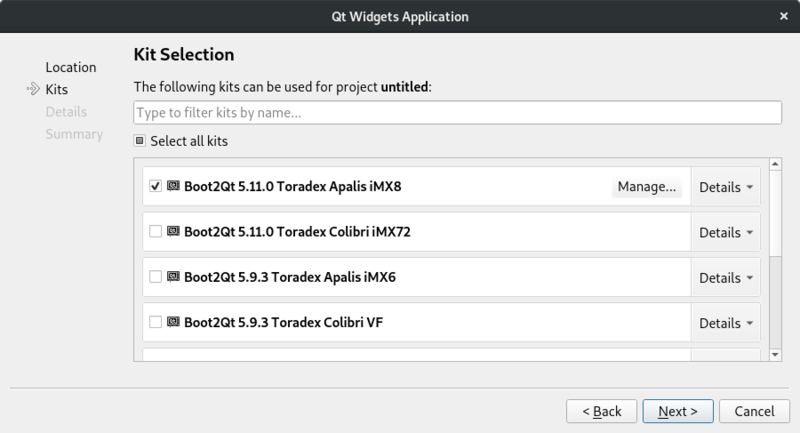 When creating a new project, make sure to select "Boot2Qt 5.11.0 Toradex Apalis iMX8" in the kit selection. To setup a device configuration under "Tools", "Options..." with the IP set to the IP address the target device got assigned (check using ip addr). This setup will allow to directly deploy Qt applications to the target.